How is life for the 12 year-old Sok Heng in an urban poor community? 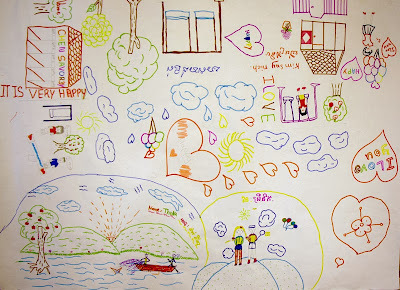 Hello, my name is Sok Heng, I’m 12 year-old and I live in Andong 3. I’m starting Grade Six in October at Kauk Roka Primary School and my dream is to become a writer. I like to write in Khmer about everything which happens to me, my friends at school and my family. My favorite subjects in school is Khmer and Math and I like to go to classes, even though there aren’t textbooks for all the students and we have to share them between us. Siem Reap, CAMBODIA, July 2013 – Two month old Veha* was abandoned at birth at Angkor Hospital for Children in Siem Reap province, northern Cambodia. It was not the first time a child had been deserted there. Some parents see it as a ‘safe’ place to leave children anonymously when they cannot raise them for health, financial or family reasons. cared for by foster mother, Som Yai* (*names changed). PREY VENG, Cambodia, 15 May 2013 – Seven year old Srey Mao wants to become a doctor and her five year old brother, Sam Nang, wants to be a teacher. With their baby brother, Sranoh, they live with their mother, 37 year old Yam Seath, in a small bamboo house in Por Pi village, Done Keung commune, about 40 km from the provincial town of Prey Veng. 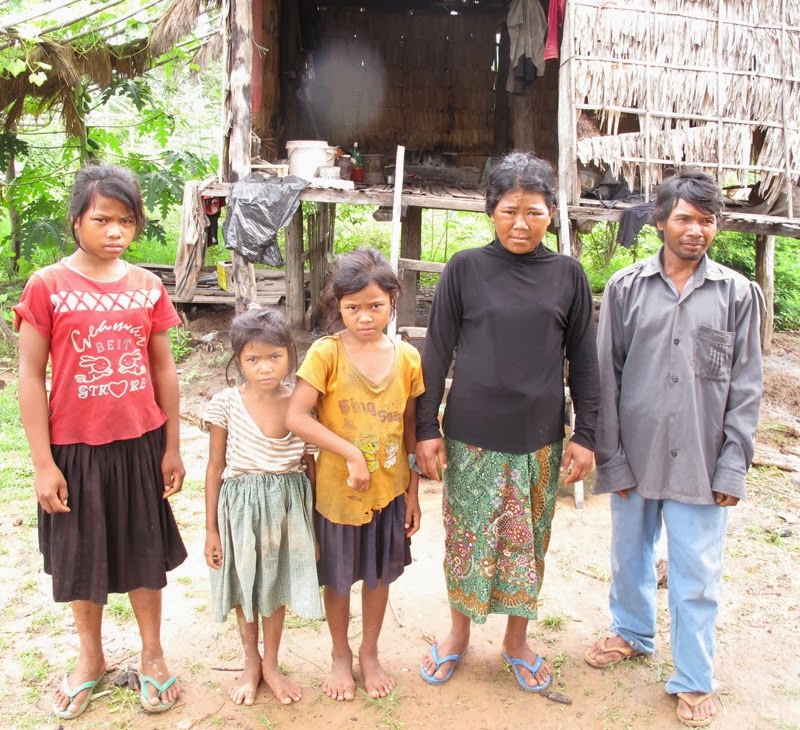 They returned to the village after their father abandoned the family in 2012 following a failed relocation to another province. 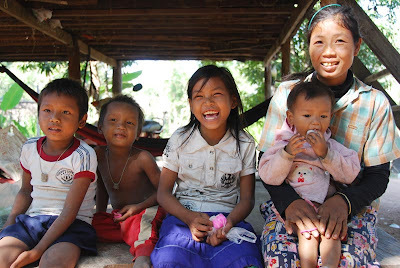 Though their mother cannot read or write she has big ambitions for her children. Labels: Birth certificate, birth registration, Cambodia, English, feature, Prey Veng province, Unicef Cambodia. recovered from severe acute malnutrition following the full treatment regimen. 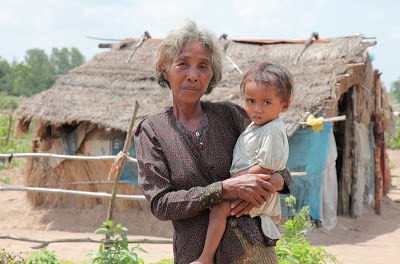 ﻿﻿SVAY RIENG, Cambodia, 22 July 2013 – Eighteen-month-old Saroeurn Kunthea who lives in Trok village, south-east Cambodia is fortunate to be alive. 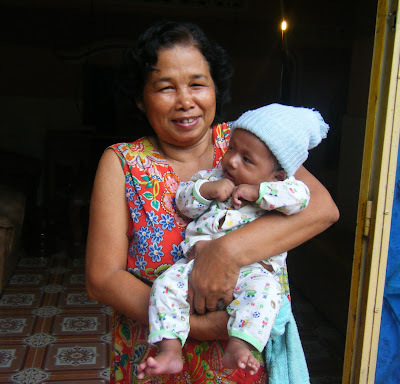 At nine months of age, weighing only 4 kilograms, her grandmother, Puth Sopheap, sought urgent help at Svay Rieng Referral Hospital. 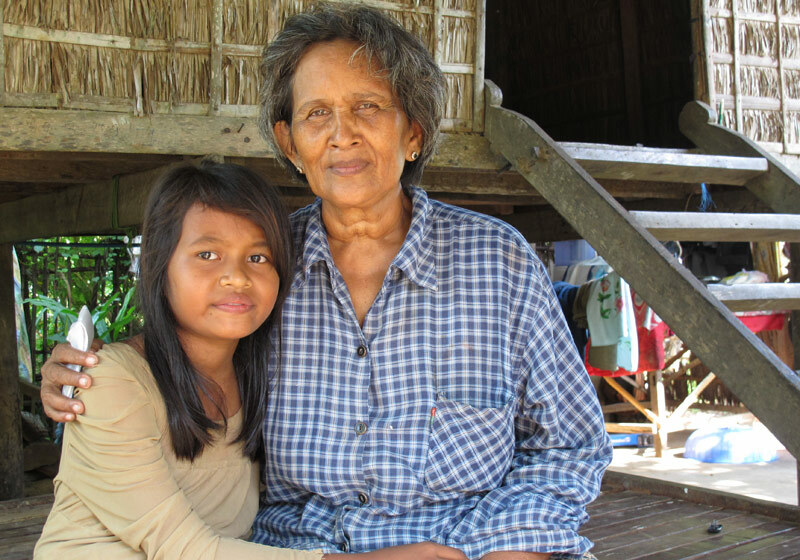 “She was in very bad condition” says paediatric nurse Mrs. Som Chanthy who saw Kunthea when she was admitted. 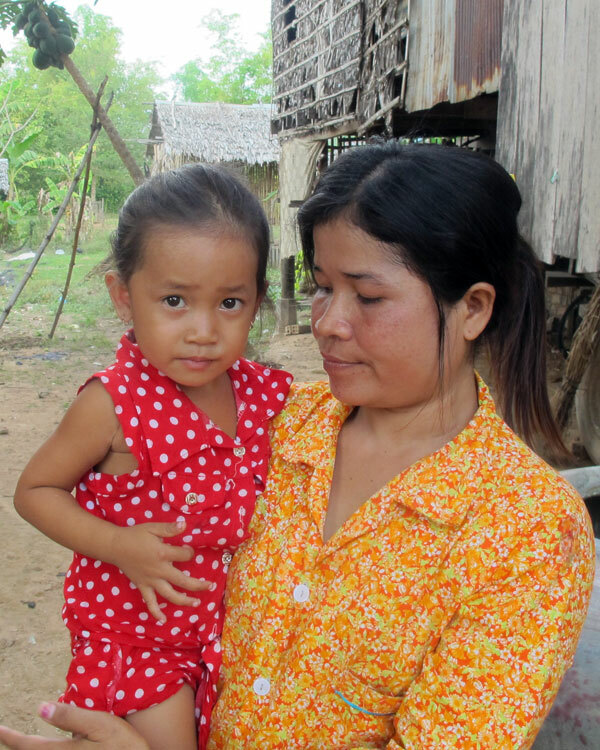 “She was lethargic, her eyes were sunken, she had a fever, a swollen abdomen and diarrhoea.” Measured, weighed and examined, Kunthea was diagnosed with severe acute malnutrition. Like 76 per cent of children under the age of 2 in Cambodia, Kunthea’s condition was the result of an inadequate diet. Though her mother breastfed her before and after going to work at a garment factory in town, her only solid food each day was watery rice. 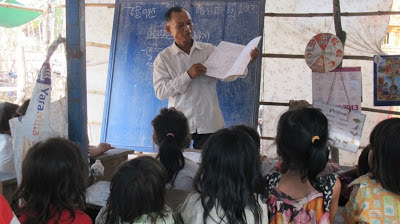 In Angkor Chea village, community preschool teacher Mr. Son Lonh reads a story to a packed class of 22 pupils aged between 3 and 6. 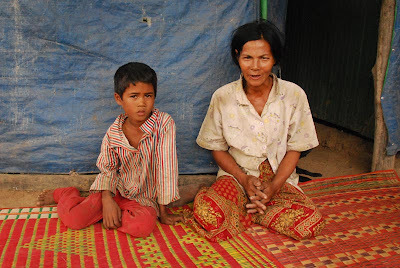 In the village of Angkor Chea, 45 kilometers from the town of Prey Veng in south-eastern Cambodia, 22 children aged between 3 and 6 are sitting tightly on benches under a makeshift tent. All eyes are on the teacher’s picture-filled storybook. Storytelling or picture-reading is part of the daily routine at the community preschool (CPS). It is an activity which older children from the nearby primary school also stop by to enjoy. At Takeo provincial hospital, nurse Ken Nim leads 16 young people (10 girls and six boys) through the agenda of their meeting of ‘Mondul Mith Chouy Mith’ (known as ‘mmm’). Chantrea, Bopha, Vichet and Syha are four friends aged between 14 and 20 who live in Takeo province in southern Cambodia. 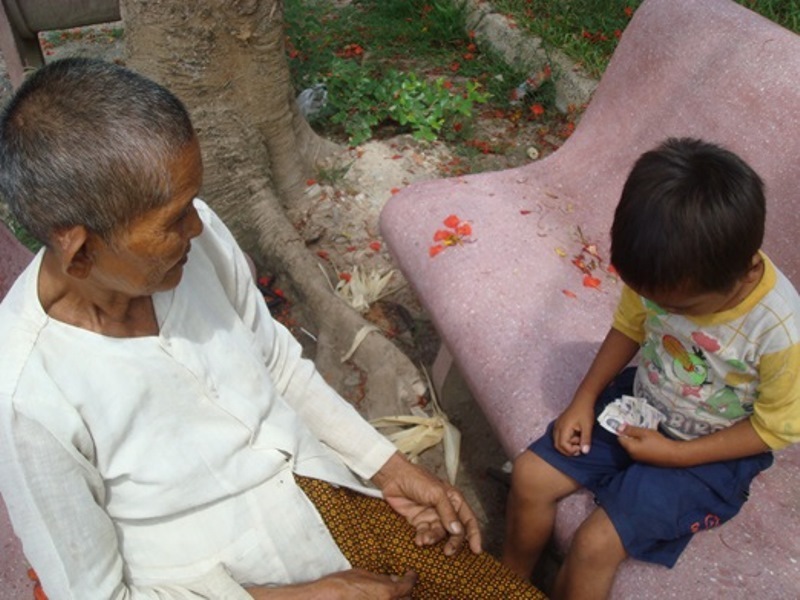 They meet monthly to socialize and exchange news, discuss good nutrition and how to stay healthy. They are all HIV positive. On the last Thursday of every month they get together with other young people as part of the peer support group Mondul Mith Chouy Mith (friends helping friends), known as ‘mmm’. 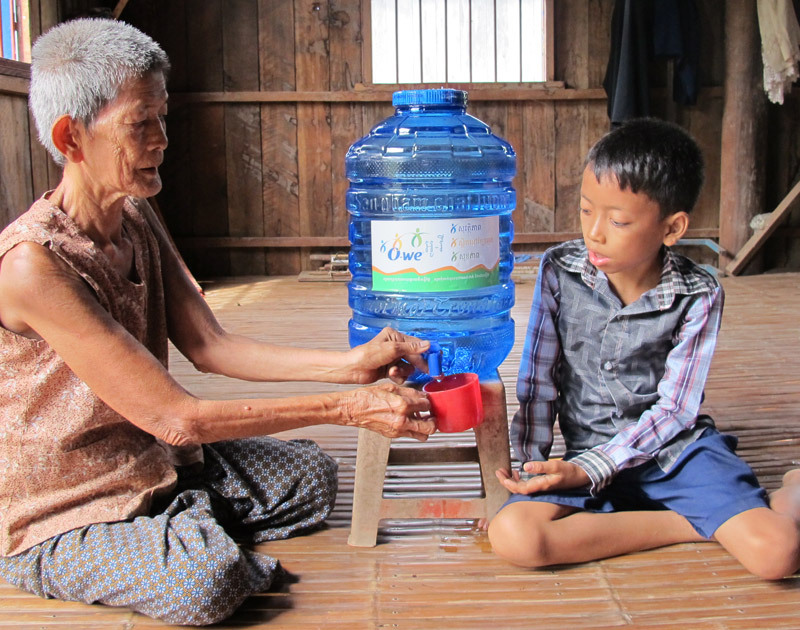 11-year-old Youen, cared for by his 80-year-old grandmother, was admitted to hospital in 2012 with severe acute malnutrition. 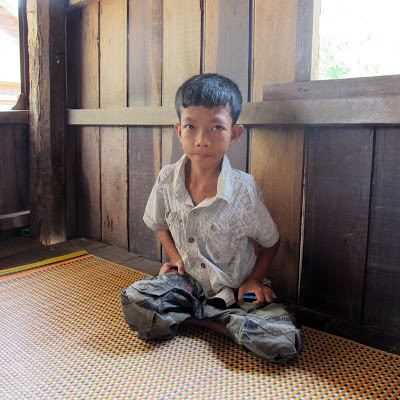 In 2011, Cambodia introduced National Paediatric AIDS Care guidelines to incorporate HIV testing for all children hospitalized with severe acute malnutrition whose HIV status was unknown. 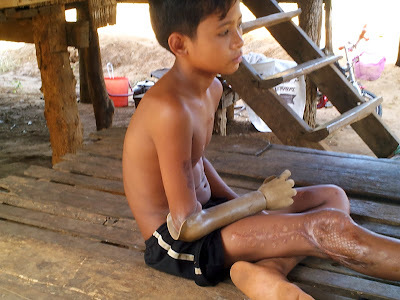 Today in Kampong Speu province, 11-year-old Youen is alive and healthy thanks to the connection made between these two conditions. Houg Socheat with his grandmother Houv Kim Chroeu. Just 80 metres from the Tunle Touch River in Preak Changkran village, the continuous noise of running water can be heard coming from a bright blue building, positioned between a primary school and a pagoda in Prey Veng province. This building, centrally located in the village, is the new solar-powered community water treatment and bottling system, that purifies water from the nearby Tunle Touch river, seals the safe drinking water into 10 and 20-litre bottles and distributes them to households and schools in Preak Changkran commune. Khun Phorn, commune women and children focal point for Ta Sda commune. At the start of another busy day, 60 year-old Khun Phorn, women and children focal point for Ta Sda commune in Battambang province, north-western Cambodia, consults her year planner, to review her tasks and jot down a few reminder notes. The year planner is more than a diary. Produced and distributed annually by UNICEF and the Ministry of Interior, it contains invaluable information on civic registration, health, nutrition, water sanitation and hygiene, child protection, emergency preparedness and education. During her outreach sessions with residents in the commune Phorn uses her year planner to share knowledge on each of these issues and promote the benefits of social services including birth registration and pre-school education. 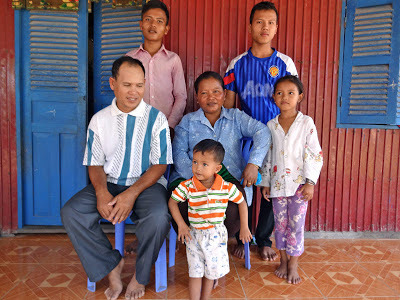 Sok Khen, aged 11, wants to complete grade 12 and become a Khmer language teacher. My name is Sok Khen. I’m eleven years old and am in grade 3. I live in the Prek Khsach village, in Kiri Sakor district. My house is only a couple minutes’ walk from school. My house is medium-sized. It is made out of wood and the roof is made of metal sheets. Mondul Mith Chouy Mith helps to improve the quality of paediatric care. 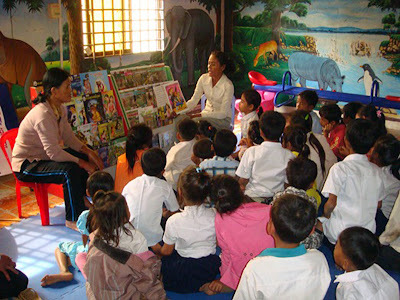 Mrs Seang Kunthea (named changed) on the right, reads a story to a riveted audience. The exterior of Svay Rieng Provincial Hospital looks much like any other health facility in rural Cambodia. Enter the two storey sand coloured building and on some of its long narrow corridors there are patients lined up waiting to be seen, some holding IV bottles and others on gurneys. But step onto the second floor in the paediatric ward and you step into a different environment where illness is not apparent. Instead, there’s a large brightly coloured playroom with a mural on very wall featuring animals from around the world. A blue and red see-saw and bright yellow rocking horse signal that there’s fun to be had here. Lines of origami shapes in pink and yellow are draped from the ceiling and underneath, more than 30 children sit wide-eyed on a large blue mat riveted by a story being told by a volunteer. Complementary feeding campaign promotes nutritious porridge for children 6 – 24 months. Vath Ngim (C), her neighbour Roeun Heourn (L), and her aunt Oum Kheng prepare ingredients. It is eight in the morning in Ponleak village, Kampong Thom (central Cambodia) and the sun is already high in the sky as a line of oxen amble down the dry dirt road past Vath Ngim’s house on stilts. 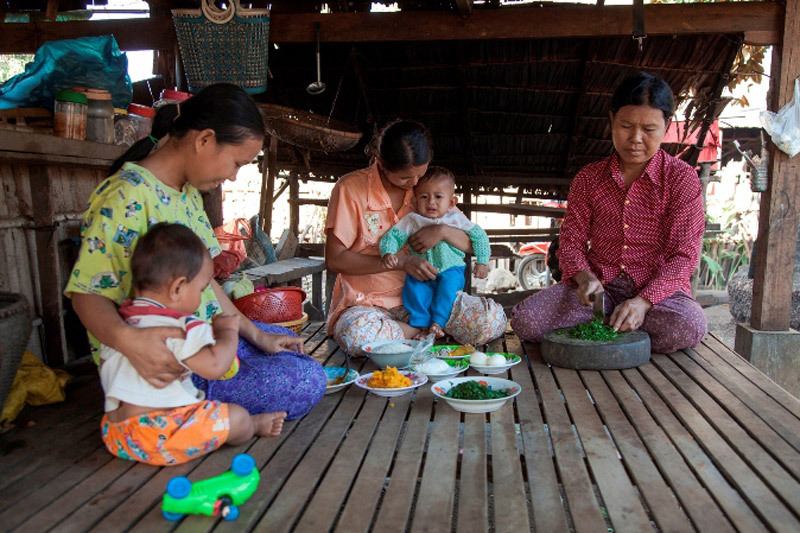 She is chatting and laughing with her neighbour Roeun Heourn as they sit on a large wood-slatted bed in the shade beneath her home, chopping ingredients for their babies’ morning meal. Along with Ngim’s aunt, Oum Kheng, they are making Bobor Khab Krub Kroeung, a thick rice porridge made with vegetables and oil, and either meat, fish or eggs. 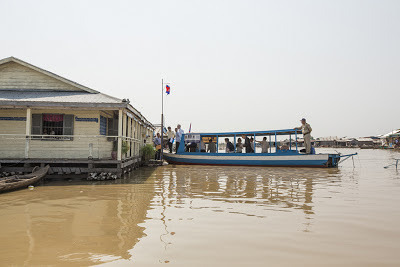 Fourteen boats were presented on Tuesday 26th of March for use by District Offices of Education in five Cambodian provinces as part of a programme to improve the monitoring of primary schools supported by the Capacity Development Partnership Fund. UNICEF Germany Ambassador and students use the new handwashing facilities. In March, fashion model, singer, actress and UNICEF Germany Ambassador, Eva Padberg, visited Cambodia to see UNICEF-supported activities in health, water, sanitation and hygiene. Ms. Padberg is supporting a campaign by UNICEF Germany to raise funds to provide safe water to children in Cambodia and five other countries. Soksan School recently took part in a campaign to encourage parents of out-of-school children to enrol them for the new school year. These are the stories of some of the children who are now attending school for the first time. Since 2011, the Capacity Development Partnership Fund, a joint fund from the European Union, Sweden and UNICEF worth just over US$ 14 million, has been supporting the Royal Government of Cambodia to implement its key policies including the establishment of ‘child friendly schools,’ where children enjoy good quality teaching and learning in gender-sensitive, safe, learning environments with adequate water and sanitation facilities. Kong Socheat and her grandmother. Kong Socheat lives in Khsach Pouy village, Voat Kor sangkat, about 30 minutes by motorbike from Battambang city, north western Cambodia. 6 years old girl is ready for primary school as a result of attending a preschool. Parents in Prey Kuy commune have been singing the praises of the community preschool since it opened in 2011. 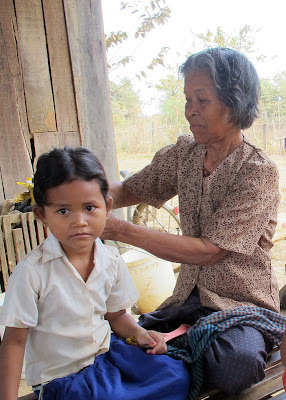 Mrs. Phath Soveun, a farmer, is pleased that, as a result of attendance at the community preschool her six-year-old daughter was well prepared to enter primary school. 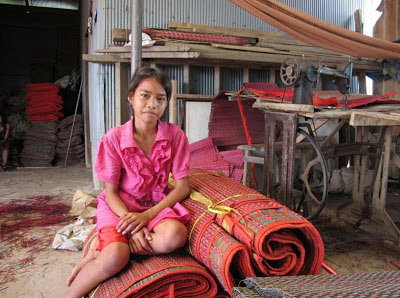 The most vulnerable families in Tang Kroch village have received help from their local commune council through a ‘social services envelope’ scheme, supported by UNICEF thanks to generous contributions from Japan Committee for UNICEF and the United States Agency for International Development (USAID). 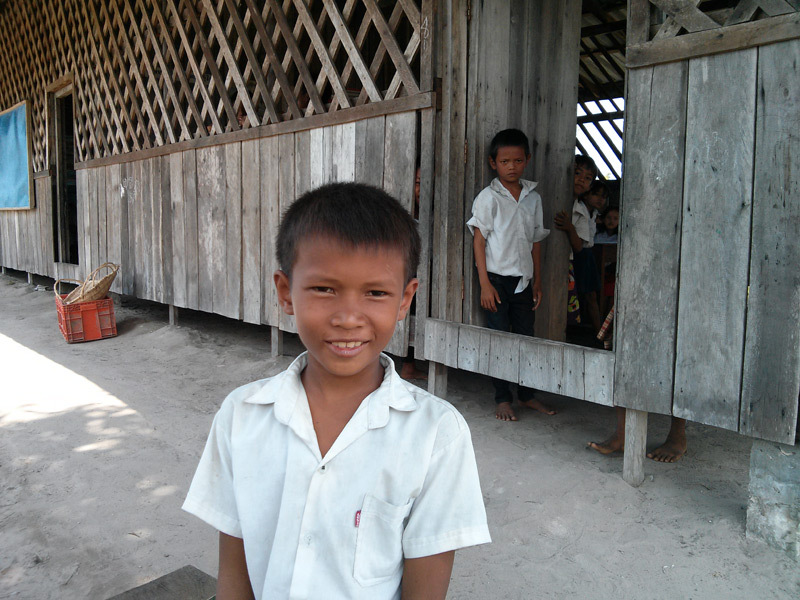 Thirteen-year old Loinh Chantou attends Preak Cham School in Prey Veng Province, Cambodia. 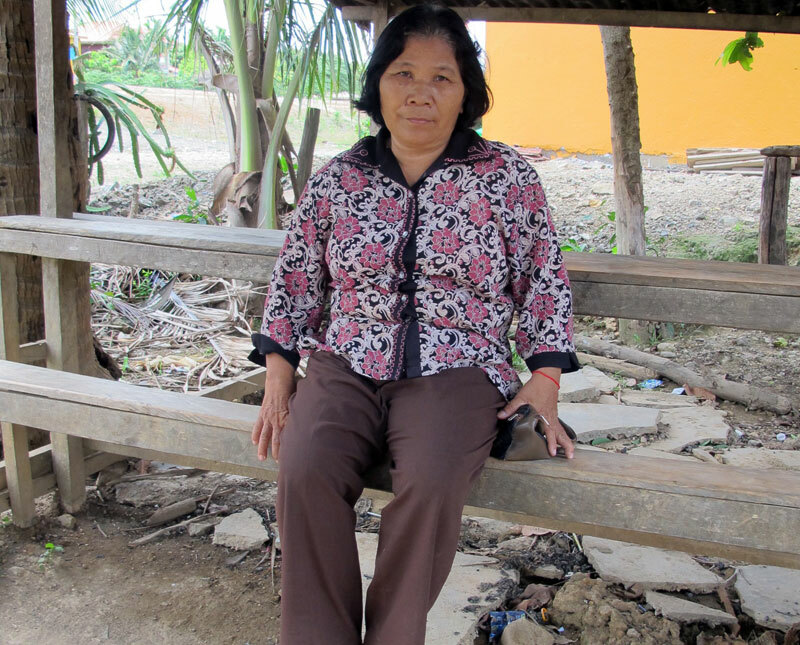 In September 2011, both her school and home were engulfed in the worst floods to strike Cambodia in a decade. Three-quarters of the country and over 1.2 million people were affected. Nearly 250 people died, mostly children who drowned in the flood waters. 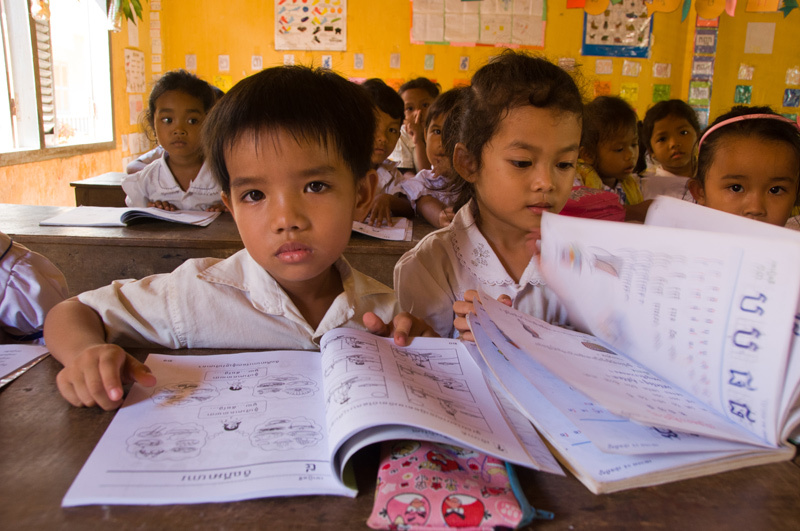 In Cambodia, 20% of primary schools do not have toilets. UNICEF is working in partnership with the non-governmental organization, Borda, to provide new water and sanitation facilities in schools. Schools and children in Prey Veng Province are recovering from the worst floods to strike Cambodia in a decade. Three-quarters of the country and over 1.2 million people were affected by the 2011 disaster. Nearly 250 people died, mostly children who drowned in the flood waters. 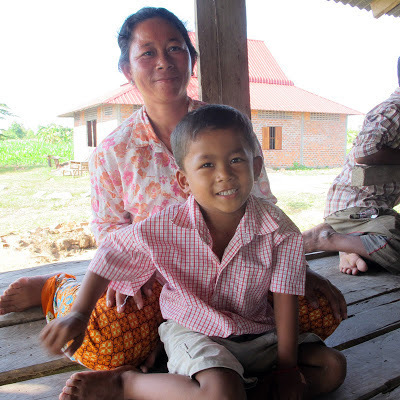 Children in Cambodia are reaping the benefits of ten years’ successful promotion of breastfeeding. As a result of a multi-faceted strategy that addressed family and community practices, policies and the health system, the rate of exclusive breast-feeding rose from 11% in 2000 to 74% in 2010. An innovative and engaging media campaign, coupled with extensive health-worker training and the establishment of Mother Support Groups resulted in healthy children and a reduction in the infant mortality rate. Samnang has learned more about eliminating maternal and neonatal tetanus. 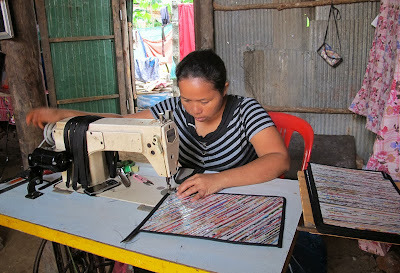 Inn Samnang, aged 45, knows all too well the choices for women delivering a baby in Cambodia; she’s made them all. At her home in Bavet Leu village, Chipsu district, Svay Rieng province (south east Cambodia), surrounded by her husband and four children, she recounts personal decisions that reflect a progressive improvement in practices to keep women and newborns safe in childbirth and the critical first few weeks after birth.